Metro has done it once again. Who knew so many wonder news tidbits could focus on donuts. 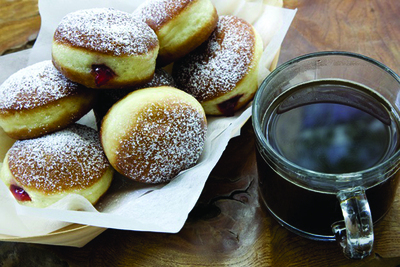 With the holiday season in full swing it is only fitting that we consider traditions from around the world and with that let me introduce you to the sufganiyot. 1 Place the flour, sugar, yeast and salt in the bowl of a stand mixer and whisk to combine. Add the yolks and milk and mix, using the hook attachment on medium-low speed until a shaggy dough forms, about 1 minute. Add the butter, increase the speed to medium high and mix until the dough is smooth, shiny and elastic, about five minutes. 2 Coat a large bowl with oil. Form the dough into a ball, place in the bowl and turn to coat in the oil. Cover with plastic wrap or a damp towel and let rise in a warm place until doubled in size, about one to one-and-a-half hours. 3 Lightly flour a baking sheet; set aside. Punch down the dough, transfer to a lightly floured work surface and roll until about 1/4-inch thick. Using a 2-inch round cutter, stamp out as many dough rounds as possible and place on the prepared baking sheet about 1/2 inch apart. Gather the dough scraps into a ball and roll out again, stamping rounds until you have 30 total on the baking sheet. Cover loosely with plastic wrap or a damp towel. Let rise in a warm place until puffy and about 1/2 inch thick, about 30 minutes. 4 Place the vegetable or canola oil in a Dutch oven or a large, heavy-bottomed pot and set over medium heat until the temperature reaches 350°F on a candy/fat thermometer. Meanwhile, line a second baking sheet with paper towels and place a wire rack over the paper towels; set aside. Place the jam or jelly in a piping bag fitted with a 1/4-inch round tip; set aside. 5 Using a flat spatula (don’t use your hands—this will deflate the doughnuts), carefully transfer the dough rounds, one at a time, into the oil. You should be able to fit about six at a time, leaving at least 1 inch of space in between and keeping the oil temperature at 350°F. Fry until the bottoms are golden brown, about 90 seconds. Carefully flip with a fork and fry until the second side is golden brown, about 90 seconds more. (If air bubbles appear in the doughnuts, pierce with the tip of a paring knife.) Remove with a slotted spoon to the wire rack. Repeat with the remaining dough rounds. 6 When the doughnuts are cool enough to handle, use a paring knife to puncture the side of each to form a pocket in the center. Place the tip of the piping bag into the pocket and pipe about 1 teaspoon of jam or jelly inside. Dust with powdered sugar before serving.